Pompous (pom-pos) adj. 1. Full of high sounding phrases, bombastic; 2. Characterized by excessive self-importance; ceremonious. Jack (jak) n. 1. A man; 2. One who does odd or heavy jobs; 3. A portable device for raising heavy objects. Slang Money. Pompous Jack (pom-pos jak) n. 1. A Kick A$$ Rock N Roll Party Band!!! There is always a serious party going on at a Pompous Jack show! Kansas City's Pompous Jack is a three piece party rock band that plays good time music from four decades of rock and roll often putting our own spin on crowd favorites. From 70's & 80's party music to current hits, our shows are high energy, audience involving, fantastic and bombastic. Pompous Jack features two lead vocalists: Scott (drums) & John (bass guitar) both with excellent vocal & playing style while Dan brings the big guitar sound. Together, our individual musical strengths and years of experience form a cohesive wall of sound. …If your name is on the guest list, No one can take you higher, Everybody says we've got, Great balls of fire - AC/DC. 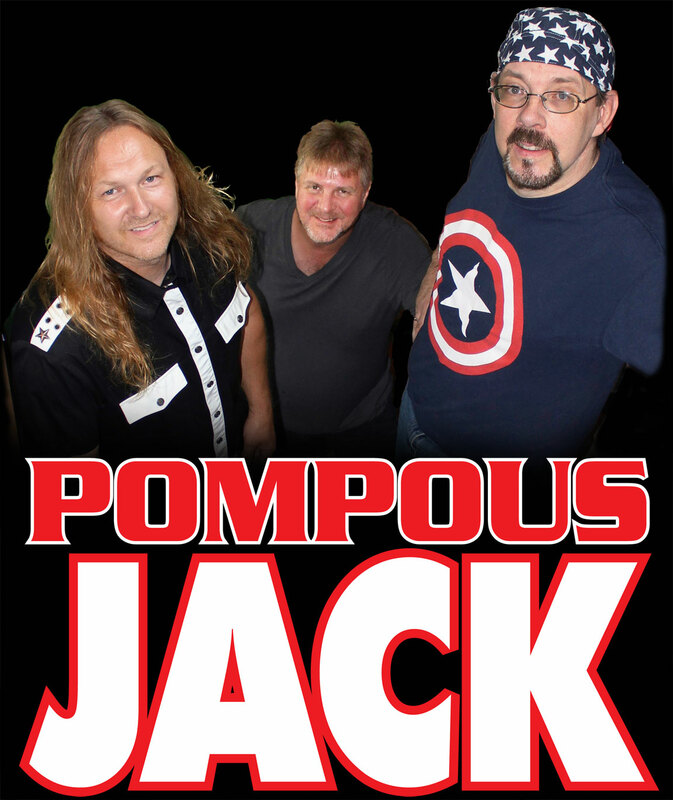 Pompous Jack has shared the stage with such bands as: Poison, Jackyl, Bad Company, Fire House, Dr. Hook, and Ian Gillan of Deep Purple and have headlined concerts at The Uptown Theater and AMC 30. We have made several appearance on national TV including HGTV's Look What I Did! & Off Beat America performing our original party rock song I Want It. We have wowed crowds at many venues in the Kansas City Missouri area and beyond. Pompous Jack is available for private parties, clubs, bars, concerts and special events. If you provide the stage, we will provide a high energy, fun and unforgettable rock n roll show! Or if it's an outdoor event and you don't already have a stage, we can bring our mobile gig rig, a portable stage or parade float. Throughout the year the band can be seen rocking outdoor events and parades like Brookside's St. Patrick's, Old Shawnee Days, De Soto Days and Lenexa's 4th of July. We have won many Best Music awards. Expect the unexpected, and hang on for a wild ride!